Use CASE statement or IIF function to provide a meaningful error message instead of NULL when the conversion fails. PARSE will result in an error if the conversion fails, where as TRY_PARSE will return NULL instead of an error. Example : Using TRY_PARSE() function with table data. We will use the following Employees table for this example. 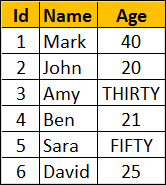 The data type of Age column is nvarchar. So string values like (THIRTY, FIFTY ) are also stored. 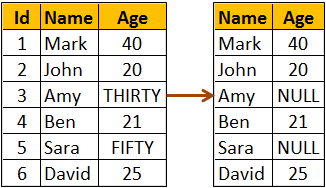 Now, we want to write a query to convert the values in Age column to int and return along with the Employee name. Notice TRY_PARSE function returns NULL for the rows where age cannot be converted to INT. If you use PARSE instead of TRY_PARSE, the query fails with an error.